Considerably large parts of the map of Ireland are dedicated to “Gaeltacht” areas. The Gaeltacht areas are those parts of Ireland where it was deemed over the years that Irish Gaelic was the predominant community language in those areas. The borders of these Gaeltacht regions are outdated. Out of 155 “electoral areas” in the Gaeltacht, only 14% of those areas (21 of them) are where Irish Gaelic is still spoken daily by two-thirds of the community in 2015. In May 2015, an authoritative report said that social use of the Irish language is declining at an even more rapid rate than predicted in 2007. This summer, we as a family spent a long weekend on the Dingle peninsula. An absolutely beautiful part of Ireland. Well-worth visiting. We stayed at a B&B on the peninsula. In the house, there was a young school-aged kid. He speaks Irish Gaelic natively. He and our kid played away in Irish Gaelic, which was great to hear. But today, there are only remnants of the Gaeltacht around him. At the very tip of the peninsula, the community does indeed speak Irish Gaelic. In tiny villages, you’ll hear this. Even in the larger “towns” on the peninsula (where there are a couple of hundred people living), the English language is the community language these days. The Irish language will dwindle for a long time in the traditional Gaeltacht areas. It won’t suddenly disappear from memory. “Urban Irish Gaelic” is not a remedy for dead Gaeltacht areas. The premise is that Irish language speakers network in an English-language dominated city. It does seems to be the way of the future. The language will survive in “nooks and crannies” of society, as Conn Ó Muinneachán described in our podcast episode. Don’t underestimate the energy that is behind the language. It has jumped a generation. Through organisations, many young Irish people are interacting through the language. What can you do? Don’t give up, that’s not the point. It’s what you can do. As Dineen Grow said on our podcast, start something. Learn a little Irish Gaelic each day. Take our Bitesize Irish Gaelic free trial to start now. Share your learnings online. Look for other people in your area who would also be interested in meeting up. And when you do visit Ireland, show the locals that you’ve spent the effort to learn a couple of phrases, or more, of their language. You’ll get smiles. And you might just help the language a little bit further. (The map graphic is adapted from Wikipedia, under a Creative Commons license CC BY-SA 3.0). As a development officer working in one of Ireland’s Gaeltacht areas, I have to say that I find the tone of your article to be somewhat disapointing. The Gaeltacht is not dead, and to suggest otherwise is to mislead your readership. The future of the Irish language as a community language is not certain, the reports that you referenced have shown clearly the risks that exist and the need for action. It is wrong to assume however that no action is being taken or that there is no future for Irish as a community language in the Gaeltacht. 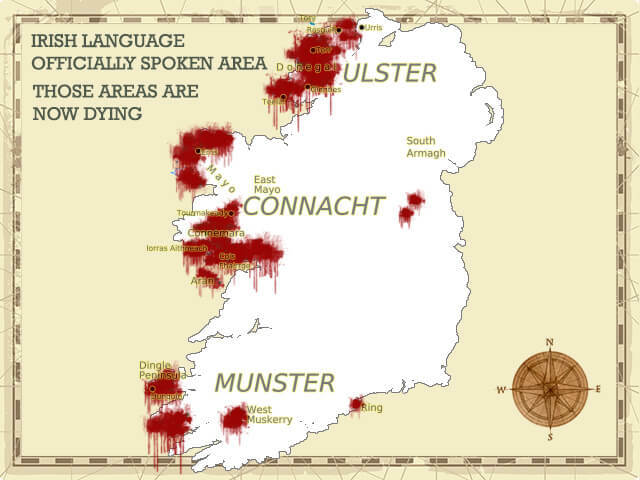 In some parts of the Gaeltact, Irish is dead as a community language, in others Irish is in decline. However in others it is thriving as a community language, not merely lingering, and faces no immidate threat. In others still it is growing in use as the community language. The latter is the case in my own Gaeltacht area in Waterford. You might think that such a statement is an overly optamistic claim by someone with a vested interest, but the truth of the claim is proven in the report that you have referenced in your article. The Gaeltacht is far from dead, and while there are challenges, there is no reaon to assume that those challenges are insurmountable. Bainisteoir Forbartha, Comhlucht Forbartha na nDéise. thanks for sharing your experience, and I’m glad to here about thriving and growing Gaeltachtaí. Consider this: The political evironment that causes disruption of teaching native language is the true culprit. It is from home speaking, first schooling and forward that is important to sustain the language. Multi-cultural integration of language is a death knell to any language. Witness the USA which is a train wreck because of the school systems acceptance of ‘multi-cultural’ learning. Even their voting ballots are in multiple languages and the law states, very clearly, that a requirement for citizenship is the speaking, understanding and ability to write the English language! I was in Mayo this summer and made attempts to speak Irish in the North as I cam down through O’Mally territory, but found it discouraging. I wish the Irish Government would identify B&B’s where Irish is spoken. One day I found one west of Westport and spoke with the Bean a ti and returned the next day hoping to continue our conversation and she discouraged it. I think the Tourism Board should reward the folks who are making Irish important, even if its just a superficial greeting, everywhere, we should be hearing Dia Dhuit, Failte and Slan; imagine going to Spain and not hearing Hola, or France and no Bonjour. it’s an excellent idea, since there are B&Bs run by Irish-speaking families. One thing I do, is when I comment on travel sites about Ireland is that I use bits of the Irish language and I strip the anglicising away from Irish place names. I find the Gaelic place names for Irish places, use them and promote them and use my dictionary and the help of Vicipéid (Wikipedia) to translate the Irish Gaelic versions into actual English words that you can find in Irish to English dictionaries. I also use Irish language when I communicate with the Aran Sweater Market and never mind if their Irish is rusty or not. I manage to get little bits of Irish out of some of them. I asked them to wish both Merry Christmas and Nollaig Shona Duit to speakers of both languages in Ireland and abroad. That is great to hear that you are using Irish Gaelic wherever possible. I am sure that people feel better after they have used Irish Gaelic as you have motivated them to speak their native language. Tá grúpa Gaeilge bheag againn i Washington, DC gach oíche Déardaoin ag baile príobháideach. We have a small Irish language group in DC every Thursday night at a private home. Úsáidim an Ghaeilge gach lá na seachtaine. I use Irish language every day of the week. Maith thú, a morgan. Tá sin ar fheabhas! How did you find the other learners? Eoin, reading about the Gaeltacht dying almost made me cry, Gaelic is such a beautiful language, I already liked it, but when I heard the poet you invited to your podcast read one of his poems, oh, even when I could hardly understand like two words, the musical, ancestral, beautiful sound of it made my heart leap. I haven’t met any other person in Mexico really interested in learning Irish Gaelic, so sometimes it gets hard for me to advance when there’s practically no chances to practice it on day to day activities, to talk with close people, but I won’t give up, Irish Gaelic, Ireland, is a very especial thing. Thank you for all your effort and work in giving us tools and keeping Irish Gaelic learners motivated -go raibh maith agat! Irish Gaelic will be kept alive as long as there are people who are putting efforts to learn this great language. Feel free to contact us at any time, if you have any questions regarding the grammar, pronunciation, lessons, etc. We will be glad to assist you. I’m very new to the Irish language and what has been happening in Ireland with Irish, but the more I listen, look and learn from the people, TG4 and on line/social media discussions etc. the more I think Irish can live if it shifts from the old traditional communities (which unfortunately because of the economic reality are dying) to international on line communities. Irish language and culture needs to grow in the cyber world and embrace international community which you (and others) are doing wonderfully. A lot MORE of this needs to happen to keep it alive and give it sustainability and there needs to be a generational vision internationally. It does need to be a movement and momentum needs to be created. One thing I realize from talking to people from Ireland is just how discouraging and soul destroying it is for Ireland to have gone through so many recent economic changes that impact on everything from emigration to culture to language and a whole lot more. But please don’t give up, we need people with your vision and passion for this beautiful language. PS Sorry, I just realized you said the Gaeltacht not the Irish language. I think its incredibly sad what’s happening in Ireland, the economy really has stuffed things up – how do small communities survive in this economy and language is connected to the people who are forced to move for work. Maybe they should make all foreign newcomers into the Gaeltacht areas have to learn and speak Irish. They have to speak German if live in Germany and French if they go to France, so why not? I agree with your positive sentiments – just look at the energy that TG4 shows through the Irish language. s baolach gur chruinn agus ro-chruinn an rud so. Do chaitheas-sa 8 mblian ar dha Ghaeltacht, agus eolas agam ar moran eile acu, agus is beag leanbh a bhi a thogaint le Gaeilge 20 blian o shin ann. Ni locht ar muintear na Gaeltachta a meid sin, nuair ba chuma ann no as an Ghaeilge le frasabharr muintear na hEireann. Ach ni mhairfeadh ann Ghaeilge de dheascaibh roinnt daoine scaipthe anso a’s ansud ar fud na h-Eireann a bheith a labhairt o h-am go cheile, agus aistriuchain ar an mBearla a labhairt acu, seachas Gaeilge a labhairt. Suimiúil é sin. Go raibh maith agat as do thaithí a roinnt linn.